IMMORTAL RANDY RHOADS – THE ULTIMATE TRIBUTE to be released by UDR Records worldwide on March 2015. One of the most venerated guitarists ever to grace hard rock music, the late, great Randy Rhoads, will be celebrated in the truest of fashions with the release of IMMORTAL RANDY RHOADS – THE ULTIMATE TRIBUTE on march 3th. 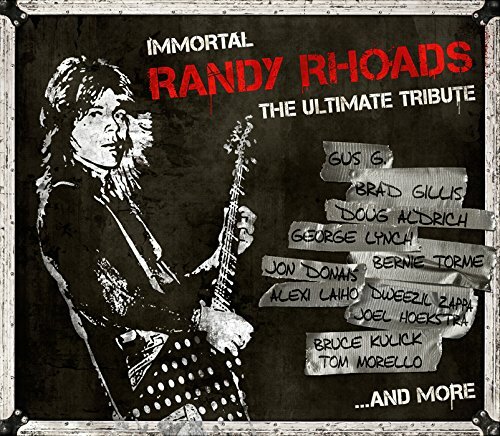 A collection of 11 classic Rhoads co-written songs, IMMORTAL RANDY RHOADS – THE ULTIMATE TRIBUTE is performed by twenty top contemporary artists, including old friends and performing partners Rudy Sarzo and Frankie Banali, his Brother Kelle Rhoads and more designated musicians like Serj Tankiann, Tom Morello, Vinny Appice, Tim (Ripper) Owens, Chuck Billy, Alexi Laiho, George Lynch, Gus G., Bruce Kulick, Doug Aldrich, Dweezil Zappa and others.